Love the spices and tools, always something interesting. Hi Rita, Very glad to hear you're enjoying your boxes. Happy cooking! Good stuff, just way overpriced. It just wasn’t much value for the money. The products were fine, they just were not close to justifying spending 50 bucks for. Hi Stanley, I'm very sorry you didn't think your Culinarie Kit box was up to snuff. While many subscription boxes focus on quantity over quality, we carefully select artisans who produce the best of the best in the culinary field--and great taste doesn't come cheap! I am happy to hear you enjoyed what you received at least, and I hope you're able to cook up something delicious. You can smell all the spices before you even open the box. I only got the first box so far but I was greeted with delicious looking and smelling ingredients and a rubber chef duck that is too cute. I got 8 ingredients total plus the duck and everything is packed in a kitchen towel which is a cool idea! I really liked this box. I gave a year subscription to my sister and her husband who just bought a house as a housewarming gift. They loved their first box and said they can't wait to see what the next one has in it. Now I'm waiting for my dinner invitation lol! Culinarie Kit offers some of the most creative recipes and ingredients I’ve ever seen. Flavor profiles you thought were forever segregated are brought together to make something greater that it’s parts. Every month is something new and unique! My friends think I’m a genius in the kitchen and I’m gonna keep it a secret that it’s all from Culinarie Kit! Culinarie Kit is a box overflowing with cooking goodies. I got to open the first box (Gourmand Kit) and it was filled with unique ingredients I haven't tried before and some kitchen tools (chef soap?!) I'm sending one to my mom because she will love it too. What a great idea for a subscription! I love culinarie kit! Using culinarie kit helped me branch out with my cooking, trying new ingredients and new ways to approach food. I gave it as a gift to my mom, sister and grandma and we were all able to try new things together, even living hours away. I won a free box on instagram and just got it today. This is so cool. I got a thai grilling spice, rasberry pear vinegar, hawaiian black salt, cajun spices, and rasberry rose preserves. The recipes are awesome too. I'm going to make the watermelon feta salad today because I just bought a watermelon yesterday. Thanks!!! 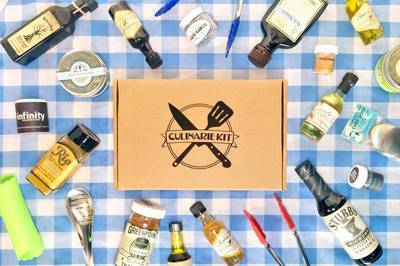 Culinarie Kit curates each monthly subscription box with ingredients that are to die for, and a rubber chef duck. The box I received had three different seasoning mixes, and Thai chili oil. This box comes with five different recipes to use the ingredients with. But you can be creative, and use the ingredients for various other recipes if you are feeling adventurous. This box is great for a beginner cook to a more experienced one. I love that with this box, you can finally try a dish that you've always wanted to try. I tried making the chicken satay & peanut sauce, which I've always wanted to try. I can tell you it was a SUCCESS! Just a little note though, read the recipe carefully because the tablespoon and teaspoon are both capitalized. Don't accidentally put in tablespoon when it should be teaspoon. Other than that, create some dee-licious dishes with this wonderfully curated subscription box. Happy Cooking! Enjoy! 1. The cute little bottles and containers! I love the sample sizes that way I can try a bunch of different stuff without having to buy full sizes! 2. The recipes! They are so unique and I have yet to come across something I have made before. I loooove growing my recipe collection! 3. Heart & soul. I can tell that the kits were put together with thought and love and I can feel that each time I open a new box. 4. Allergy sensitive. I have specific nutrition needs, and it was so easy to request recipes and ingredients that fit my needs. I've also never had any issues with shipping, billing, customer service, or the product itself. I have been a monthly subscriber since box #1! I highly recommend ordering it!! !